Are you one of those people who likes to solve problems on the job by sketching your ideas for coworkers? 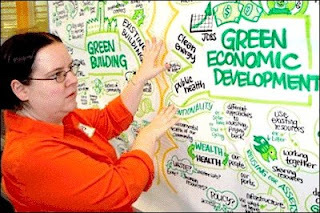 Are you a visual communicator interested in putting your drawing skills to work for businesses and organizations? Check out what these sketchers are doing to answer the call of duty as graphic recorders and graphic facilitators. 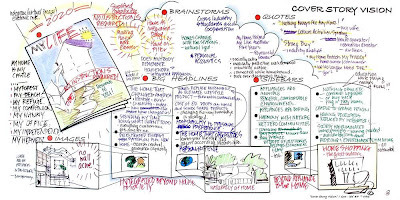 Increasingly, corporations and organizations are using visual communication during brainstorming sessions between executives, managers, and employees. 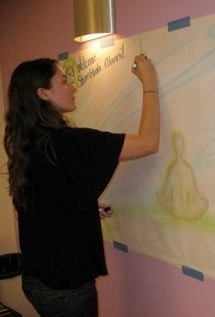 Graphic recorders, according to Reilly Dow (pictured above), draw large murals that “act as a public memory, and help participants in any meeting or conversation share complex ideas.” Reilly says that “Graphic recording is a powerful tool for synthesizing conversations, dialogs, meetings and events. The recorder creates large-format visuals in real time, tapping into the collective intelligence and wisdom of a group and bringing it to life with graphics.” View Reilly Dow’s website called Pinkfish.